Well while all our eyes were focused on what was happening in and around the Italian parliament ISTAT released the November retail sales data last Friday. 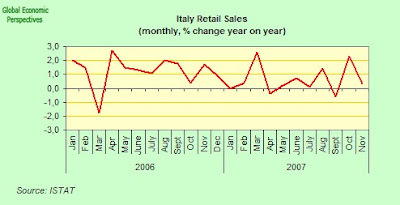 Italian retail sales rose 0.3% on year in November. Food sales increased at a 2% annual rate, while non-food sales fell 1%. Retail sales dropped 0.3% on a monthly basis in November, reversing 0.4% growth recorded in October. This data is slighly at variance with the picture being presented in the PMI readings, and it is hard to know how to interpret this difference. What is clear is that October was a good month, while sales evidently dropped back again in November. 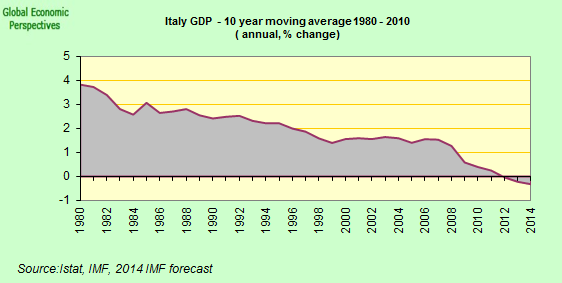 What is most pronounced if we look at the chart is how even though 2006 and 2007 were pretty favourable years in terms of Italian GDP growth, retail sales have continually struggled to grow.